Rule 1: Your GPS is lying! up the hill from where the map pin lands, on the right. Church Cottage amd The Good Shepherd’s Hut are in the grounds of St. Nicholas’ Church. 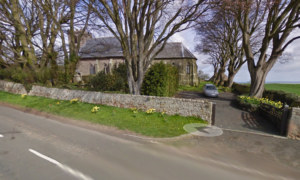 If you’re arriving by car, follow the A1 to Fenwick (a mile south of the Holy Island turn off) west on the B6353 for a mile, and Church Cottage is to the side of St Nicholas Church, Kyloe it’s on the right as you climb the hill. There’s a bus stop (north and south bound) at Fenwick, buses run from Berwick, Alnwick and Newcastle. (X18) The nearest train station is Berwick upon Tweed – its about £18 in a taxi from there or £4 on the bus to Fenwick. Park here in the car park. The cottage is just behind the car in this photo. The Good Shepherd’s Hut is to the left behind the curch.